Discussion in 'Manchester United Forum' started by charlenefan, Mar 7, 2018. I'd love us to go back to 442, but as it stands, we don't have the wingers, fullbacks or pace out wide. Formations are starting to matter less and less every season. It's all about more complicated systems and triggers that can pull specific players into specific positions at certain times. It's true that Pogba tended to drift out wide in 2016 with Juve, but by no means was he a left winger. With the importance of wingbacks now, all players need to be fluid in their positions. We have seen multiple times - how 4-4-2 chases shadows in the midfield. We need 3 in the midfield. Come on, now, where are you getting this from? Don't know about our best formation, but people on here were banging on about how we needed to change to 4-3-3, and now we have, and since we have we've been absolutely fecking shite. The improvement when we switched back the other night was so obvious it was painful. Still think having a blanket formation for all circumstances with the players we have is never going to work. You take the opposition into account...and also all too often with us, what players we have fit. Any formation we use requires top fullbacks and we don't have any sadly. None of our fullbacks would get into any of the best teams in the world and the last game we were much better going all out attack with no fullbacks. That tells you everything. What do you mean? Its just common that 2 man midfield gets dominated by 3 man midfield. Maybe you have forgotten how we were never near the ball in our two CL finals against Barca. Even discounting Barca, we struggled with our 4-4-2 against other european teams, do you remember our match against Bilbao not so long ago? Yep. The grass isn't always greener as they say. We could maybe use a 4-4-2 diamond but we don't have the players for a flat 4-4-2. As I see it, the recent adoption of 442 in specific circumstances by various teams (as per the OP) has not involved the 'classic' form of 2 CMs and 2 wingers. Thus I am surprised that the lack of wingers suitable for this, and the vulnerability of the midfield when playing like that, has formed such a theme in the thread. Luckily there has been some discussion of less conventional 442 options. It does seem to me that a midfield diamond (which some may portray as 433?) could be useful at times - but as has been noted above, we do not have (or have not yet developed) the necessary attacking skillset in our full backs to exploit this to its full attacking potential. The arguments that people make seem off to me. Firstly: we need wingers to cross. Why? Because that's the way we played the formation in the 90s? Barcelona play Iniesta on the left, who tucks in, and their plan, it would seem, has been to have Dembele on the right, who doesn't seem that type of player. Their width comes from Alba, who is able to get so far forward because of the movement centrally of Iniesta. Shaw would be perfectly suited to this role because he is both younger and better when attacking than Valencia. Secondly: Pogba would be wasted out wide. Pogba wouldn't stay. He would move inward, give us a extra man in the centre and allow Shaw to pass him on the overlap. This is how 4-4-2 works, I believe. We had Beckham tucking in, unlike Giggs, who held the line. And Neville was our most adventurous fullback, I believe. Thirdly: We'll be chasing shadows in midfield. I think the move to 4-4-2 is precisely being made to give teams more bodies in midfield. If anyone saw Juve-Spurs the other night you might have noticed how Matuidi was tracking Eriksen for a lot of the time he was on the pitch. It is easier to do this when you have a midfielder like Matuidi nominally playing wide than a forward like Mandzukic. Barely any different to a 433. Pogba would come inside more often than not and Lingard would push forward to link up with Lukaku and Sanchez, instead of sticking to the right wing. It is very similar. The difference is that you have a midfielder on the left, instead of a forward. You are more defensively secure. Barcelona have Iniesta instead of Neymar. This is important because the move to 4-4-2 is made probably to track the high fullback/inside winger. Famously this was done by Atletico to thwart the famous Messi/Alves combination. A midfielder helps more than a forward in these situations. Don't think merely changing formations will make a massive difference at this stage, to be fair - they're a loose framework at best - and the exact Xs and Os aren't always replicated on the field given how dynamic football is and how each manager interprets specific formations. 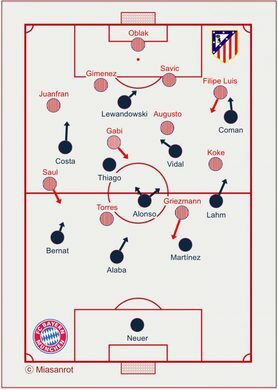 Some players might be closer to their best positions in nominal terms, sure, but unless their roles are more defined and better understood and implemented, our attacking transitions become better and quicker, we play with greater chemistry and hunger and resolve and discipline, become more proactive and decisive in possession, the ideology being professed by the manager is more coherent, key positions are addressed regardless of the formation being employed, the players who're supposed to be impactful start delivering on a consistently high level, and so forth - we'll never evidence the kind of improvement people are expecting or do justice to a rigid term like a 442 formation, and concerned folks will always suggest the next paradigm shifting idea in strictly tactical terms. A 4-4-2 needs proper wingers, Sharpe, Giggs, Beckham, Ronaldo, Kanchelskis etc. And you're offering up Lingard and Pogba? feck me. I'd like a proper winger to be added the team at some point soon, and then the 4-4-2 will at least become an option for us, but right now it absolutely isn't. For those pointing out Juve, we don't have Douglas Costa ffs. Move on from this 4-4-2 idea until we signed that type of player. We need that type of player for pretty much any formation we want to play surely? The potential problem with the above is that Sanchez and Pogba will get in each others way. But otherwise looks good. How can we play 442 when we don't have a single winger for that formation? Hell, even now with 433, I don't how we do it without a RW in the team. We haven't the wingers / wide men to play it. I love two proper forwards, playing up front it gives your team a constant threat. Lukaku with Sanchez off him would be brilliant and nightmare to defend against....But you need wide players and we have none. You also need attacking full-backs and our full backs may reach the opposing18 yard box if they are lucky. Played a 442 for most of the game against PSG and it worked pretty well, especilly when Young went right back. Defended in two banks of four and even the two strikers dropped back in. Had a Athletico Madrid feel about it under Simeone. Going forward, I'd definitely like to see this again, but with a few minor changes. If you can afford 3 attacking players, why play 2? The bigger issue is to see Pogba as a #8 in 2019. Imagine watching the last three games and having the audacity to overlook Lukaku! If you play two CFs and people to cross from wide, then you play Lukaku. Hopefully this summer we offload Sanchez. Not really, and if thats the case, then McTominay should be in the team, as he has also been fantastic in the last three games. No, because we have better players to play that suit that strategy than McT. Rom + one of the other two up front is better than the other two. I’d rather have Rashford as a lone striker though. I've come to the conclusion that our recent success is not entirely due to tactics. Really? I think Luke Shaw this season has been one of the best left backs in league. Problem is on the right. Or, you don't rate Luke? that was when we had Valencia and Young at RB and LB respectively. shaw wasn't in the team and I think he made some good steps this year but still has more to offer. And Martial is better than Lukaku. The only issue is Pogba really. I could see us going 4411 and playing Pogba behind the striker in a Scholes 2003 sort of role, but to expect him to play in a 2 man midfield is a bit of a stretch. It also defeats the object of playing with two up top which is to play Rashford and Lukaku at the same time. That said I don’t have anything against the idea as such, and if Ole can make it work I’d welcome it. Not with Pogba in the XI, he’s more effective further forward. But this could be another solution if Pogba is injured or needed rest.